The issue of cloudy water can be a baffling phenomenon for many aquarium owners. 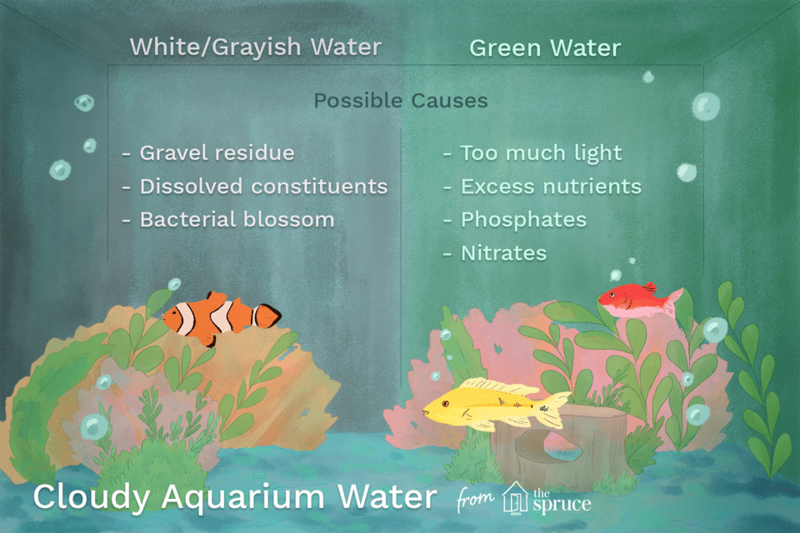 Unfortunately, there is no single answer as to why your aquarium water is cloudy because there is no single cause. However, based on the color and circumstances under which cloudy water appears, it usually can be pinpointed to a couple of basic causes. Gravel Residue: If the water is cloudy immediately or within an hour or two of filling the tank, it's probably due to insufficiently washed gravel. Drain the tank and rinse the gravel until the water runs clear. That should resolve the problem. Dissolved Constituents: If washing the gravel doesn't solve the problem, the next most likely cause of cloudy water in a newly filled tank is a high level of dissolved constituents, such as phosphates, silicates, or heavy metals. If you test the water, you'll likely find that the pH is high (alkaline). In these cases, treating the water with conditioners will often resolve the problem. Another option, that has many benefits beyond resolving cloudy water, is to use RO (Reverse Osmosis) water. Your local fish shop may sell it or sell units capable of making RO water. Bacterial Blossom: Often, cloudy water doesn't appear the instant an aquarium is set up. Instead, it appears days, weeks, or even months later. The cause is usually due to bacterial bloom. As the new aquarium goes through the initial break-in cycle, it is not unusual for the water to become cloudy or at least a little hazy. It will take several weeks to several months to establish bacterial colonies that are able to clear waste from the water. Over time, that cloudiness will resolve itself. Decaying plants or excess food that remains uneaten can also cause the milky water seen in bacterial bloom. Regardless of the cause, don't panic over bacterial blooms. Keeping the aquarium very clean by removing debris such as decaying plants and uneaten food, vacuuming the gravel regularly, and performing partial water changes will quickly resolve most cases of bacterial bloom. Cut back feeding to every second or third day, which will reduce excess food decay. If there are particles of debris in the water that you are unable to remove via water changes and vacuuming, a flocculant may be used to clear them away. Flocculates cause particles of debris to clump together so they can easily be removed by the filter (be sure to clean your filter so it's working at peak efficiency). Flocculates are generally marketed as water clarifiers and may be found at your fish shop. Too Much Light: The most obvious cause and the easiest one to cure is too much light. Placing the aquarium in direct sunlight or leaving the lights on too long will result in algae growth. Reduce the amount of time the lights are on, and move the aquarium to a location out of direct sunlight. Excess Nutrients: Nutrients such as phosphates and nitrates also support the algae growth and must also be reduced to successfully battle algae. A water change will give some immediate relief but probably won't resolve the problem completely. It's important to deal with phosphates and nitrates at their source to rid yourself of them. Phosphates: Phosphates come from two sources—decaying matter such as fish food, and from the water source itself. Testing your tap water for phosphates will let you know if you have a problem with your water source. If your water naturally has a high level of phosphate, you will need to use RO water or a phosphate remover to treat the water. Reducing the amount of food you give your fish, and changing to a brand that is lower in. Nitrates: Nitrates naturally rise in the aquarium over time as a byproduct of fish wastes. The only way to remove them is to perform a water change. Make sure your filter is kept clean and is adequate for your tank size. Also, make sure you have not overstocked your aquarium, or you will constantly battle rising nitrate levels. A vast majority of cases of cloudy water can be resolved by weekly 10 to 15% water changes, keeping the gravel very clean, and using good quality food.